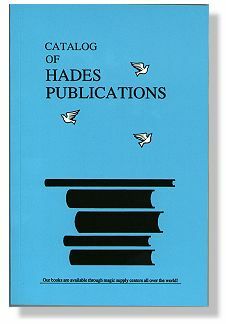 Our complete online catalog of books, manuals, manuscripts and other items can be viewed by clicking the Catalog of Hades Publications cover below. Or, you can go directly to the alphabetical list of titles by clicking on one of the letters to the right of the catalog cover image. I appreciate the service and the response. Your web site was easy to use and looked good. You guys have some really great books here! Keep up the good work , 'cause I'll be checkin' back often! I received the books yesterday. Thanks for your excellent service. Great selection ... have no more time to spare ... I have to go and make my selection. Good to see that you have a web site...a very good one indeed. This page is copyright © 1999 - 2006 - All rights reserved.